Chefs bring out the Heavy Duty Aluminum Foil Rolls when standard gauge foil is not enough in restaurants. Standard aluminum foil is ok for wrapping items and for covering items for storing and later reuse. But, for cooking, you'll what heavy duty aluminum for lining pans and cooking sheets. Heavy duty aluminum foil is better for wrapping poultry and meats for the freezer, lining roasting pans for easy cleanup, and making an oven packet for cooking fish, chicken, or vegetables. Restaurant supplies like Heavy Duty aluminum foil are typically not found at retail stores because they are more of a foodservice item. Handi Foil Heavy Duty Medallion - 18 in. x 1000 Ft.
Handi Foil Heavy Duty Medallion - 18 in. x 500 Ft.
Handi Foil Heavy Duty Roll - 18 in. x 1000 Ft.
Handi Foil Heavy Duty Aluminum Foil Roll - 18 in. x 500 Ft.
Handi Foil Heavy Duty Roll - 24 in. x 1000 Ft.
Handi Foil Heavy Duty Roll - 12 in. 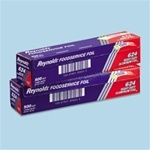 x 500 Ft.
X-Heavy Aluminum Foil Dispenser Box - 24 in. x 500 ft.
Our wholesale Heavy Duty Aluminum Foil Rolls are used in restaurants, delis, bakeries, and other foodservice businesses throughout the country. Foil has unique properties that protect food from burning and cool super quick. It is also better at moisture retention of food than is plastic wrap. In addition to uses around the kitchen, aluminum foil can be used for such things as making toys for kids or pets, more effective ironing, crumbled up to make interesting patterns in plaster or paint, helping boots and shoes retain their shapes if stored for long periods, and to more easily slide furniture on carpet. Another nice feature of Heavy Duty aluminum foil is that it is environmentally friendly since it can be recycled.